The first time I made these was when I was trying to make a green vegetable SO delicious that even a 5 year old would fall in love (#nannylife), and guess what? Totally worked. And now I’m in love with them, too. I’m going to get right down to it with this post – we’re going to be about as short and sweet as the time it takes to make this fabulous dish, cuz there’s not much to say except the basics! 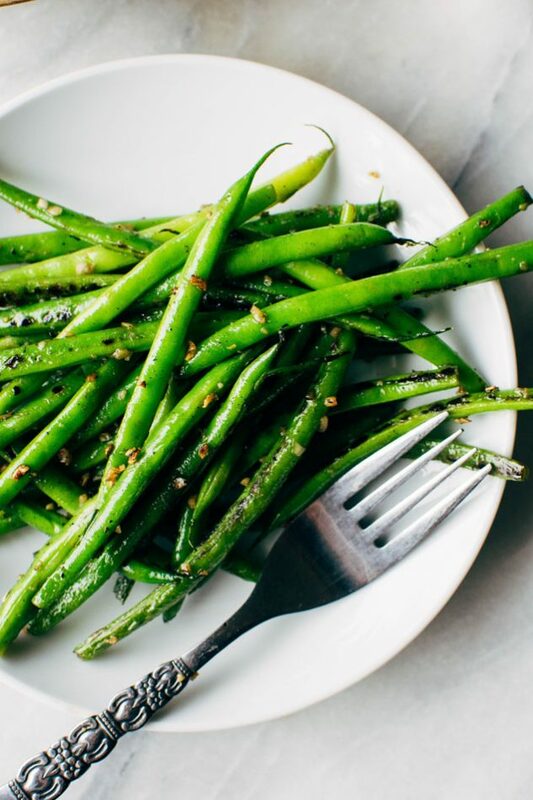 And that way you can get right along with cooking yourself up a batch of these tender, charred, garlicky green beans. Boil and blanch green beans VERY briefly – just cook ’em enough so that they turn bright green, but remain very crisp. Heat a saute pan (preferably a cast iron skillet) until it’s smoking hot. 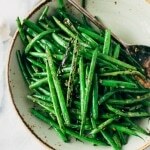 Add those green beans with a smidge of oil to the pan and let them CHAR. Which means not stirring them often so they maintain contact with the hot skillet for long enough to get some color. Just before they’re done add alllll that chopped garlic and cook just a few minutes, tossing them a bit until everything is nice and aromatic and that garlic is crispy. Finish with a bit of butter or ghee if you’re feeling fancy, but for those dairy free folks this step is totally not necessary. And that’s it! 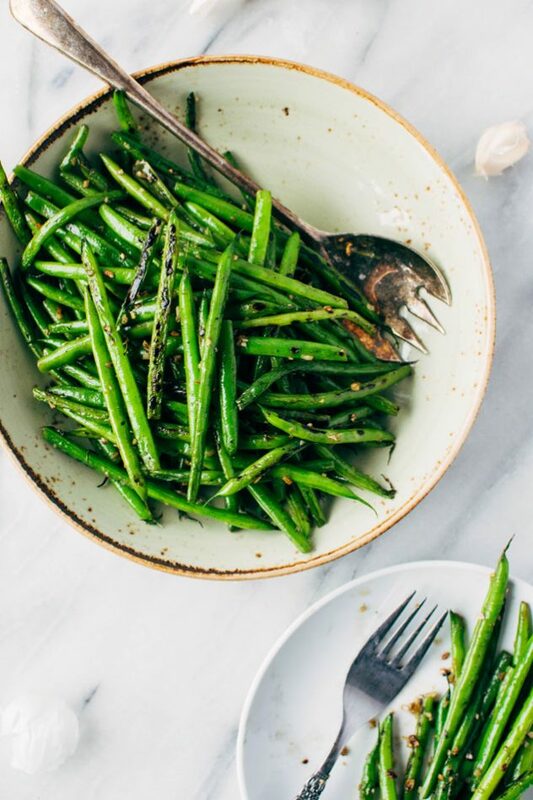 Magically delicious + complex 3 ingredient garlic charred green beans are SERVED. 3 ingredient garlic charred green beans! The easiest and most delicious side dish you’ve ever laid your eyes on. 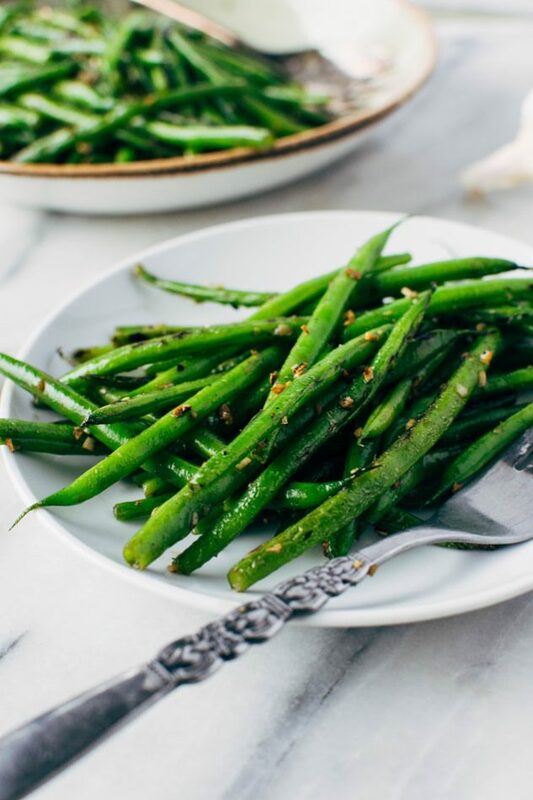 Ready in 15 minutes flat, these green beans are great paired with any main dish – or made at the beginning of the week and added to lunch // dinner // breakfast bowls throughout the week! Add green beans and cook for 1-2 minutes, removing quickly with tongs or a slotted spoon to an ice bath to stop the cooking. 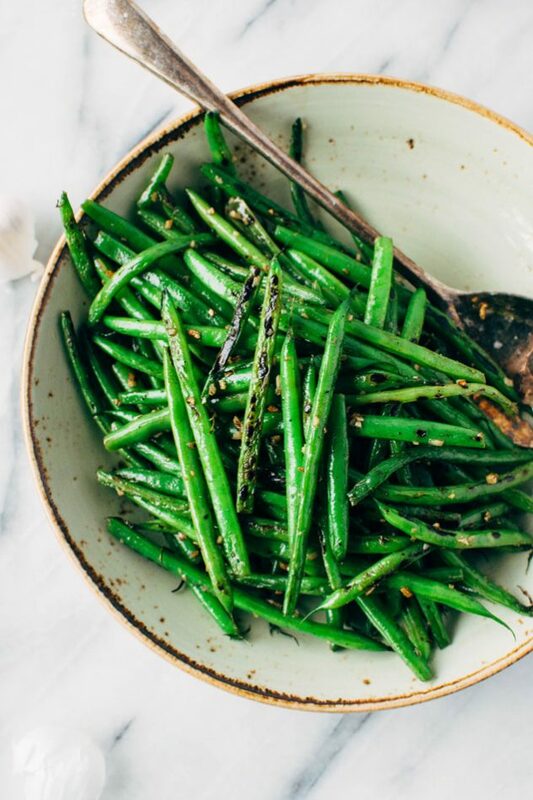 If you’re using regular greens beans, which are a little thicker than haricot vert, you will want to increase the cooking time to 2 1/2 – 3 minutes. After beans have cooled, drain and pat completely dry. Heat a large skillet (cast iron works best) to medium high heat until smoking hot and add 1 tsp of high heat cooking oil of choice. Add green beans and let them sit for at least 30 seconds before tossing them. Keep up this pattern. Sit for 30 seconds and then toss, to encourage charring. For a total of about 3-4 minutes. When beans are almost ready to come out of the pan add chopped garlic and toss a few times until garlic is aromatic and crispy. Remove from heat, season with salt add the teaspoon of ghee or butter if desired, and serve! This entry was posted in side dishes and tagged garlic, gluten free, grain free, green beans, healthy, paleo, quick, vegan, vegetable, vegetarian on March 15, 2017 by Nyssa Tanner. Truly magical! Gonna get me a batch of green beans so I can try this! Yay!! Yes! They’re so easy and delish Enjoy!! !